Instead of a Christmas tree some may opt for a Norfolk pine (Araucaria heterophylla)which is usually available in stores before Christmas. It may be sold plain or decorated to serve as an alternate mini Christmas tree for those with little space. Once the holiday is over, the Norfolk pine can double as a patio or long-lasting houseplant. Norfolk pine, belongs to the ancient genus of evergreen conifers, Araucaria, which includes the newly discovered extinct Wollemi pine. It is hardy in zone 10-11. In the wild this semi-tropical tree can get up to 200 ft. tall. Norfolk pine grows a massive straight tree trunk with symmetrical lateral branches that are an impressive sight in the landscape. When grown indoors as a potted houseplant the diminutive version usually grows up to 8 ft. tall. Indoors provide a cool, bright filtered light, humid environment with temperatures of 60-72F during the day and slightly cooler at night. They prefer a few hours of direct sun but can adapt to bright indirect light. Be sure to rotate the plant to maintain a symmetric shape and keep the plant from leaning over to one side. Norfolk pine also need 50% humidity which can be difficult to provide during the dry heating season in winter. Some ways to increase humidity is to run a humidifier or use a pebble tray filled with water. Water when the top inch of soil feels dry and let the water drain from the bottom. Do not let it stand in water or saturate the soil, over watering will cause bright yellow needles that eventually fall off. Conversely, keeping the plant too dry with low humidity will cause brown tips. Keep it away from heating vents or cold drafts which can dry out the needles. Feed your plant when it is actively growing (not winter) with a diluted, balanced houseplant fertilizer every 3-4 weeks. Feed new, younger plants every 4-6 months and older plants every 3-4 months. Prune only brown dead lower branches. Do not cut off the growing tips. If the growing top is damaged, it will not be replaced and you will get a misshapen tree. Pests: Common pests that attack Norfolk pines are spider mites, scale and mealybugs. Did you know: In nature, Norfolk pine cones take 18 months to mature, then break down. The scales produce edible seeds that Green parrots favor. hi, i have a seven foot norfolk island pine about 25 years old and though some branches dried and fell off at the lower part it now has a growth in the middle of the trunk that looks like the top does when a new row of stems starts…it is growing where one of the branches fell off – can i cut it and plant it? it really looks like a two inch new tree! The problem is that the 2 in tree has no roots. You can experiment by cutting it off and dipping it into a rooting hormone, then plant it in well drained potting soil. Keep it in a humid shaded area (outdoors) when it’s warm out. Don’t let the soil dry out. I have never tried it so can’t tell you if it will work. I have a Norfolk Pine over ten years old, it was my grandmothers and now it’s my mothers and will be mine. However, my mom had to suddenly move, in the middle of the winter on a really cold day and a lot of her plants got really cold, almost frost-touched, her Norfolk included. It looked better than any of the other plants that really got hit bad, even had some bright green on it still. But then it got more droopy than usual, and now it’s turning gray and listless and dull. It’s still got a little bit of bright green here and there and that doesn’t seem to be going away, it’s not going brown or dry and we’re watering as normal but it’s droopy and gray. Any ideas? Thanks. I’m sorry to say that most likely your Norfolk pine will die. The grayish color is an indication that the needles are dying. Hello. I have had my Norfolk since 2003- 13 yrs. It began as a small xmas tree barely a foot tall and is now well over 7 feet tall. This past August, I re-potted the tree. And it is doing ok however over the past few weeks, the lower branches are very droopy. I was afraid the pot is not draining adequately but in trying to get into different pot, it is too difficult and I do not want to over stress or shock the roots. I am not sure what to do; I do not want to loose this tree. It may be still suffering from transplant shock. If there is poor drainage, then eventually you will have to fix that. Do it in spring. Either it’s not getting enough water or too much. I was gifted a beautiful Norfolk Island Pine — there are three trees growing together in a small pot. Recently one of the trees went completely dead — in other words all the branches turned brown and fell off. The other two trees are fine and look healthy at the top, though some of the shorter bottom branches have turned brown. Just next to the dead tree a new tiny tree has sprouted and is growing very quickly. The dead tree remains in the soil — there is just a long stem/stump (or trunk?) sticking up with no branches. I haven’t touched it since all the other plants look fine. Should I leave things as they are? Should I uproot the dead stump or cut it at the level of the soil? Should I wait to repot and at that time remove the dead stump? Also, why are the branches turning brown? I have three two gallon pots with several Norfolk pines in each pot. My work place purchased them as decorations for Christmas. I noticed the trees were bending from the wind and needles were yellow and dry looking. I have brought them into my office to try to save them. What should I do first? I bought new pots, soil and peet moss to transplant. They are very wet due to snow as well. Need help! Norfolk pine should produce cones at 10-15 years.Wish I could tell you why they’re not producing cones. Perhaps your tree is too happy and not mature enough to produce cones. I got my wonderful NIP when it was 12″ tall and it is now over 5feet. It lives in our family room near a bow window and has done beautifully until recently. This summer, for the second year, I put it outside on our deck (and I also repotted it for the first time at the start of the summer).Last year it thrived and seemed very happy. This year when I brought it back in,, some of the top branches were turned/ angled sideways, and some of the lower larger ones were brown on top along the spines, and the “fingers” are falling off! Please help – this tree is very precious to me! I gave a Norfolk Pine to a friend. It was only a few feet high. Her puppies dismantled it. I have the main trunk with a few roots attached and a few other pieces of roots. Any chance I can save it? Best thing you can do is plant the it, leave it in a protected area so that it has a chance to grow more roots. You can also water it with a plant starter which is formulated to stimulate root growth. Hey there. I live in Florida Zone 10. About 5 or 6 years ago I planted a NIP in my neighbors yard because we thought we were going to move. Well we didn’t move. My neighbor and I are no longer speaking and I’m afraid that she will have it cut down. It is approximately 12 ft. high now with 2 smaller shoots on it. I want to dig it up and transplant it into my yard. Will it survive? If not, then I would like to get a cutting off of it to restart a new one. How do I do that? Thank you for your help. I absolutely LOVE this tree. You can restart Norfolk pine from tip cuttings but cuttings from the top of the tree will develop symmetrically. Take 6-8 in (15.2-20.3 cm) cuttings of the terminal leader in summer and treat with rooting hormone. Cuttings from lateral branches will produce irregularly shaped trees. I have moved a Norfolk Pine Bought for Christmas to an outdoor location and the top branch is browning and folding. Do you have any suggestions? Most likely its too cold for it outdoors. Norfolk pine is hardy in zone 10-11. I have a single norfolk that is about 7′ tall in one pot, and then a group of trees that are about 6′ tall in a second pot. They are both very healthy appearing. Can I repot them together for a fuller appearance, or will the root disruption for norfolks of this age/size kill them? I would leave well enough alone. If you repot them all together you will disrupt and crowd the roots in one pot. We planted a large NIP outside in San Diego about six months ago. It has black residue taking over limbs & needles on lower side towards morning sun. We did just put sprinklers for grass in the area. However, it looks to be spreading upwards. Otherwise, tree looks pretty healthy. Please HELP. Thx! I have a NIP that is about 7 feet tall. I live in South Louisiana and my pine was left outside when the temps dropped into the twenties. It was under roof so it did not get hit with a frost but is damaged from the cold. Is there anything I can do to help it recover. I don’t want to lose it as it was my deceased mothers. There is nothing you can do for cold/frost damage. Some of the branch tips may turn brown. Best thing is to keep the plant stress free. Norfolk pine prefer a cool, humid environment with temperatures 45-90F. You can move it outdoors when night temps are regularly above 45F. Give it a dose of balanced fertilizer (10-10-10) in early spring to stimulate new growth. I have a Fully mature Norfolk pine age over 100 years. It appears to be badly suffering from a disease that has been spread by birds. It starts at the top and weakens the trunk causing die back to branches as it moves down. There are patches of white sap coming through bark. 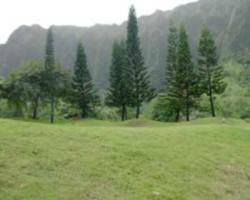 The tree is in a well watered position on a hillside aout 900 feet above sea level and about 3 miles from ocean. This dissease is found through out the Illawarrara region on thr coast south of Sydney. I am seeking help on a treatment – maybe with a neem oil mixture. I have a 9-10 ft tall tree that has oil dripping out of the ends of branches. Looks like little pearls on the tips. Is it anything to worry about. It may be transpiring moisture. Plants will drip moisture through the “leaves” when it has more water than it needs. This usually occurs in a humid environment or when the soil is too wet. You might cut back on the water. Hey. I recently bought a Norfolk Pine tree from a Hy-Vee. My past history with keeping plants alive is not very good. Any suggestions on how to keep it alive would be very appreciated. Norfolk pine needs cool, bright filtered light, humid environment with temperatures of 60-72F during the day and slightly cooler at night. They prefer a few hours of direct sun but can adapt to bright indirect light. Be sure to rotate the plant to maintain a symmetric shape and keep the plant from leaning over to one side. They also need 50% humidity which can be difficult to provide during the dry heating season in winter. Some ways to increase humidity is to run a humidifier or use a pebble tray filled with water. for more info read above article. We recently bought a norfolk is. Pine for our christmas tree. And it has been doing well, this morning i watered it and out of the bottom of the pot came some kind of larve or worm. Look very simmular to a cross between a cut worm and millipede? About 1/4″long. Any ideas? Not sure where kasey bought it most likely our grocery store. Never seen a bug like that. Not sure how to proceed. It could be a pill bug. It probably was present in the soil. Thanks for the suggestions! I really dread the idea of repotting, as I’ve heard NIPs dislike it, and our tree is so large, I can’t even imagine how we could repot it. I also just something new today, again on the largest trunk. There is a fairly long gash in the bark, not oozing or anything. If it were a snake, I’d say it looks like it is shedding skin. Also, the middle trunk looks fairly brown. I’m wondering if it may be time to call in an arborist? Or is it too late for the larger trunks? The smallest looks very good and is supple to the touch. There is also a very tiny fourth trunk staring to grow in the pot. We got a Norfolk from a dear friend who was relocating. I don’t know how old it is, but it is approx. 10-11 feet high, with 3 trunks. The tallest trunk has almost no branches lower down, and all 3 trunks have full growth high up. We keep it in a south facing room, rotate it every few weeks (she had kept it in a north facing room). We do mist it on occasion. We water it but the pot no longer seems to drain well. When we first got the tree, we’d water it and excess water drained from the bottom into the tray and we’d absorb up the excess after a few minutes. Now, within a few seconds of watering, the water pools on the top. I wait a few minutes to give some of it a chance to sink in and then absorb the excess with towels. We seem to be losing many of the “fingers” of the tree, and there are some brown needles scattered on it as well. And some of the fingers seem droopy and dry. The higher up on the tree, the livelier it seems– brighter, supple fingers, and it doesn’t lose fingers when touched. Likewise, the shorter trees in the pot seem livelier than the tallest. We’ve tried not to overwater, though it has been overwatered a few times. I only water it when the soil is dry. We have not repotted it, and it is not near vents. The room has a stable temp between 68- 72 year round (except when we lost power during a week long heat wave last summer). Transport conditions a few years ago when we moved the tree a few years ago: temp in the low 70s, clear skies, 20 minute drive while tree was covered. My question is this: how can we limit the loss of fingers and prevent droop and discoloration? I’m most concerned about the loss of the fingers (we’ve lost very few whole branches). Thanks for the advice, and let me know if you need a pic! It sounds as if your Norfolk pine needs eventual repotting into fresh well-drained soil. The slow draining soil is compacted and doesn’t allow the water, air or nutrients to be absorbed by the plants roots. For now, I would loosen up the top layer of soil and mix in either peat moss or perlite and repot in late winter. Low humidity can cause browning needles; therefore its a good idea to increase the humidity around the plant by placing it on a pebble tray or closer to a humidfier. Don’t get too carried away with watering as Norfolk pine require less water in winter. In addition, your plant is likely to be pot bound and is not getting the moisture it needs, causing the “fingers” to droop and dry.The best way to see what’s going on is to check the roots which may be difficult to do with such a large plant without transplanting. If the plant was overwatered, then the needles would start to turn a yellowish color. 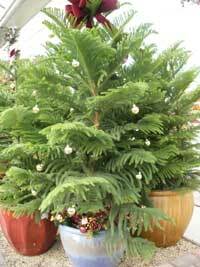 Norfolk pine is hardy in zone 10-11 and would have to be brought indoors for the winter. I transplanted a small norfolk plant and overwatered it way too much. is there anything i can do to save it. should i sit it outside as it is summer for a while during the day, will that help? You can place it outdoors, but put it in the shade. Water it when the top 2 inches are dry and make sure the plant doesn’t sit in standing water. After a few weeks outdoors, you can move your Norfolk pine to more light. My Norfolk Pine got shock. It has been losing lower branches, but showing strong life at the top. Whereas base is not as healthy as top. Can a plant of this nature be lopped off like other plants and grow new roots ? I would hate to think that it will eventually croak…. All limbs have fallen off my pine except the ones next to top. My question can a pine be layered and new roots produced so it can be replanted and saved. It is 14 years old. Yes, air layering is possible. I have seen it done with some tropical plants like Rubber plant, dieffenbachias, crotons and Norfok pine when they get too tall and loose their lower leaves. It can take several months to a year for an evergreen to develop roots especially with older the specimens. Give it a try and let us know how you did. Good luck. I discovered my cat is used my 5 ft Norfolk pine’s pot as a litter box. I removed the droppings and took out a top layer of soil. Should I re pot with new soil? It’s kind of big and probably needs a new pot anyway. If re potting is required, is compost too sweet for an acid loving pine? It depends on how long your cat decided to use it as a litter box. If there is a lot of urine in the soil, it can burn the roots. I think the best thing would be to repot in fresh soil. It’s better to use a potting soil mix. Norfolk pine can be grown in a slightly acidic soil with a ph of 5.5-6.5. Hi, and thanks for the great article and answers to the commenters questions. I was so excited to find at an Orchard Supply Hardware yesterday a Norfolk Pine (about 3′ tall) that must have been left over from Christmas. The root ball was partially sticking out of the soil so that the tree was tipped to one side a bit, but there was fresh green growth at the ends of most of the upper branches, and the bottom branches are dark green and healthy looking, so I bought it. When I got it home, I left it in the container but pushed it upright and packed potting soil around the root ball so it is now standing upright (though it’s leaning a bit toward one side at the top, I think because it was facing one way for so long at the store). I wasn’t particularly gentle with the root ball when I was packing the soil around it and hope I didn’t damage it. Is there anything else I should do for it, and would it be better to leave it outside for the spring and summer (I live in hot Pasadena, but the place I’m thinking for it is tree-shaded most of the day)? Thanks for your advice! Your Norfolk pine will enjoy the great outdoors for the spring through fall. It might even tolerate the winter, as long as you don’t get freezing temperatures. They prefer bright light and cool, breezes. So if it gets too hot in summer, move it to a shadier spot. Even in the shade, the light is better than indoors. i have a Norfolk pine with oozing sap and in the middle of the pine tree its cones are yellowing. Theres sap comming out of the top trunck as well i the middle plus some branches have sap oozing out what do i need to do to correct this problem? After a recent storm, my otherwise straight, outdoor Norfolk pine has a lean beginning about 4ft, from the top. The tree is about 16 ft. tall. What do you recommend to straighten it? Will it resolve on its own? i have a triple, twenty foot tall norfolk pines with branches from the bottom up. could i trim the existing branches from the bottom 6′ or so to create an area for a table underneath? Yes, you can trim the bottom branches to open up the area. This practice is also done with other evergreens. thanks for the reply. will treat plants and see what happens. will also keep up the misting will things get worse before they improve? dont want to give up too soon. You can also place your plant near a pebble tray to improve the surrounding humidity. I am housing several norfolk pines over the winter for a friend. I mist them 2-3x weekly and keep the soil evenly moist. there is never any standing water in the drip pan. I am now seeing what looks like webs on some of the individual fronds. not cottony balls like from mealy bugs. these fronds also pull off easily. what do you think. Check for spider mites. They are tiny insects that make webs. The plant will appear discolored or grayed. Spider mites thrive in hot dry indoor air that occurs during the winter. My mom has a Norforlk pine tree in the house, Its branches is droopy and sticky,but growing new branches, what should she do with it. It sounds as if your mom’s Norfolk pine has some insect problem. I suspect scale. See if there are any “bumps” on the stems and needles. Look closely as they may be hard to detect. If it is scale then you will have to treat it. It is a difficult bug to get rid of. I have the exact problem as Sue and am looking for an answer too! My N.P. is about 12 years old and 5′. In the summer, it loves the outdoors and in the spring/fall/ winter has grown equally as well indoors. All of a sudden, this past year it started to drop (as Sue said) the individual “fingers” and then entire branches. There are black spots on the branches and I have also noticed a white mildewy buid up on the top soil and at the base of the plant. I repotted this past summer and have been treating it for powdery mildew ( which is what I read it could be) but I have not see any improvement – if anything it’s getting worse. HELP! Like so many others . . . it’s my beloved plant. Also check the black spots and see if they can be scraped off. If so then the plant has scale. I recieved a small (12′)norfolk for xmas, it has 3 distinct trees in the clump… do I leave them together, or can I separate for 3 individual plants? You can separate the 3 plants into individual pots. I would do it in late winter early spring when they are ready to start growing. I HAVE A HEALTHY INDOOR NORFOLK PINE, 8 YEARS OLD, 5 FOOT TALL. I’M GOING TO BE AWAY FROM HOME FOR A MONTH OR MORE. I’D LIKE TO KEEP IT ALIVE IF I CAN, BUT IT’S TOO TALL AND HEAVY TO TAKE TO ANYONE ELSE’S HOUSE. ANY ANY SUGGESTIONS ON KEEPING IT WATERED? I’m guessing that you are in Australia and its summer time. Of course the first thing, I would say is ask a neighbor or friend to water your plant. Before you leave, water your Norfolk pine real good. Make sure the soil is moist and roots are saturated. Don’t leave it in standing water-drain that out. You can also move it to a shadier spot for the duration so it won’t require as much moisture. In addition, try a water globe. It’s a glass bulb with a long stem that you insert into the soil. The bulb is filler with water which slowly trickles into the soil. I had one when hurricane Katrina struck we were away for 3 months when we returned that was the only houseplanr that was alive. Visit Kris's profile on Pinterest.